Kelly Design recently completed the design of a 16-page brochure commemorating the 2oth anniversary of the installation of the organ in 1995. The brochure includes a complete history of the organs origin in it’s original downtown location through it’s current home on Farmington Avenue in West Hartford. 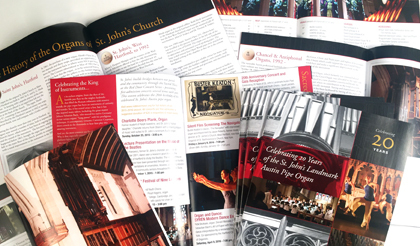 Incorporating a mix or archival images, specifications and information about current musical events and programs at St. John’s, the brochure strikes a modern chord with bold colors, colorful photography and subtle graphical design elements throughout. In addition to the overall design, Kelly Design also contributed numerous photos appearing throughout the brochure. In its earliest origins, from the days of the humble pan flute to the mighty hydraulis that filled the Roman coliseums with massive sounds, the pipe organ has been an instrument of curiosity and wonder. Yes, it has scared away a few, but it has also inspired many others, including the great master Johann Sebastian Bach, who toured his native Germany to test various organs’ “lung power” with his prodigious technique. Built by Austin Organs Inc. of Hartford, who has designed and constructed well over 2500 distinctive pipe organs all over the world, to the Organist and Choirmaster at the time of its installation, Ralph Valentine, who contributed greatly to its design, and to the support of this community of faith, who, even amid the smoking wreckage resulting from the tragic fire of 1992, heard the distant call to rebuild, rebuild well, and sing even better. And so, twenty years later, St. John’s honors that commitment and leap of faith, and celebrate the instrument that supports their song. Its 3721 pipes speak from every corner of the church, and seamlessly weave in and out of the fabric of worship. To learn more about St. John’s Austin Pipe Organ and their Sacred Music at the Red Door Series click here.